When highly evolved nano-aliens descend upon our planet to mine our plethora of carbon monoxide gasses they'll surely be piloting something like this MicroFly Hovering UFO. 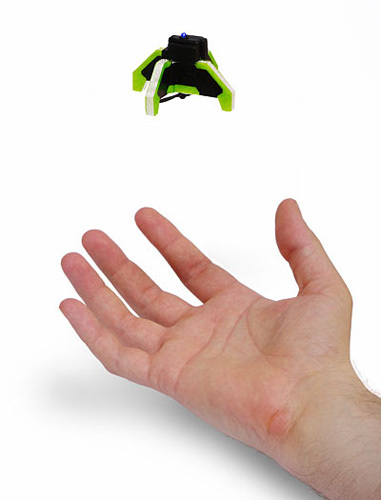 This is by far the smallest flying R/C device we've ever seen and it's damn impressive in the air. With a diameter not much larger than a silver dollar and a single propeller on the bottom, the MicroFly somehow manages to hover in the air as it spins and flashes its blue LED. The simple slider control allows only up-and down movement... but this makes it so easy to fly that anyone can instantly control it. Buy a few and create your own buzzing alien insect swarm... they use the same channel so you can control multiple MicroFly units from one remote. 10 minute charge time. 5-7 minute fly time.